I sometimes wonder to myself whether to talk about blogging here. But based on feedback and page views, it seems that people are truly curious. So I decided to share some of the overall goals I have for myself and for A Pinch of Healthy for 2015. Granted, January is two thirds of the way over, so I am not sure I can call this a “resolutions” post. However! I am a fan of making goals all year long, not just at New Years. So I am just going to go with calling this my blogging goals for 2015. Starting a blog can be overwhelming, intimidating, exciting and even terrifying. There are SO many things on the perpetual to-do list that you could really drive yourself nuts trying to do it all (<-been there!). Does all of that make your head hurt?! It does mine. NOT diving face first into a YouTube wormhole when I should be doing more productive things! Being that (1) I am a mom and (2) I work a 40-hour-a-week day job, I do not have a ton of extra time. Blogging mostly takes place on nights and weekends. I want need to make the best and most productive use of my time. I love blogging, but I do not want to become burned out to the points that it is no longer fun. Focusing my time, attention and energy is really essential to keep the wheels turning. So my specific plan is to calendar everything and develop a more formal workflow. And to stick to that schedule! I also want to be tagging tasks for things I could have somebody else do when I have the resources to outsource a few things. 2. Network with other bloggers in real life by attending local events and at least one blogging conference. I am so happy that I found Birmingham Bloggers! I already went to my first meet-up, and it was really fun. A also intend to go to at least one blogging conference in 2015. Conferences are a great way to learn new skills, discover great resources and network with other writers/ bloggers/ foodies. I hear many food bloggers say that Pinterest drives most of their traffic, and I am mystified by this statement. For example, looking at my analytics I see that I only had 204 visits to my blog from Pinterest in the last 30 days. So there is HUGE room for improvement there. Improving my food photography – things have got to be pretty to get pinned, and that is just reality. I was able to implement rich pins for A Pinch of Healthy. This means that when you view a recipe of mine from within Pinterest, you will see the ingredients already listed within the pin itself. This helps with click-through traffic. Also Pinterest is smart enough to go ahead and categorize recipes into buckets, such as vegetarian, gluten-free, paleo, low carb, etc. I am trying out a pin scheduling software, Tailwind. (<-Contact me if you would like to try it for one month free. I give a 1-month free trial away to somebody else, and they give me a month free. Win/win!) This software allows me to schedule pins for higher traffic times. The idea is that this will help re-pin rates and, as a result, increase traffic driven to my website. It also contains a ton of analytics to see what pins are performing best. I have seen what a HUGE difference improving my food photography has helped in 2014. So I want to continue to grow my skill level in 2015. Technically, I guess I am already blogging professionally since I receive income from (1) ad networks, (2) affiliate/ referrals and (3) a few sponsored activities. However! Every cent of income has been put right back into this blog. I have invested money into several technological upgrades to improve the functionality, speed and appearance of A Pinch of Healthy. I have also bought a new laptop, new camera lens and some photo editing software to improve image quality. These things do not come cheap. So I guess when I say “blogging professionally,” what I really am referring to is getting paid for my time and effort. Whether that would be to the level of a side-hustle that funds my kid’s college account…or whether it grows to the level of replacing my day-job…I don’t know yet. How do pro bloggers spend their time? How much time is put into what activities? What does it take to earn a living from blogging, and would I even want to do that? Is it possible to monetize without ruining the user experience? 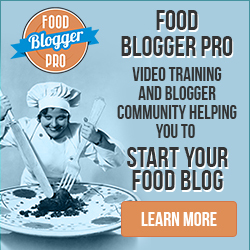 I did join Food Blogger Pro (<-affiliate link) last year, and that has been hugely helpful to me. The material and resources are awesome. But even better is the community of fellow bloggers, many of whom have already “gone pro” and are so generous with their (1) knowledge and (2) time. That is invaluable to me! I also just want to say that I did not get into to blogging to make money (see why I blog here), and I do not recommend that as a reason to start blogging. If I wanted to solely make money, there are oodles of other ways to turn a buck that are much faster, much easier than blogging. Most likely, the first few years are going to be you paying money to blog. Blogging is HARD work and is a labor of love for my readers. I would love to be able to devote more time to it, which is ultimately why I want to go pro. I can say without hesitation that even if I fail miserably at going pro, this experience has been well worth it! Besides all of the valuable skills that I have learned for myself through blogging…If I can help just one person feel a little more hopeful, a little more empowered, a little more encouraged on their own road to better health, then my work here is worth it! I hope you enjoyed reading about my blogging goals for 2015! I am excited to see where this year takes A Pinch of Healthy. Do you set blogging (or other) goals for yourself? Bloggers – are you attending any conferences this year? Love your goals! When you break down blogging the way you did you realize how much work goes into it!! It has truly evolved over the years. Portrait photos definitely do better. And lately I’ve bern putting together simple collages with pic monkey – I stick to two pictures, but a couple I’ve experimented with a little text and they are blowing up. I was torn about text & collages and held off for a while. But I’m seeing the results. I am late to the game with Pinterest as well. I have started pinning more of my own stuff, and I think another lesson learned is that I need to pin more often. It’s funny you say that about portrait pics! I have been using PicMonkey to do that exact thing. I haven’t been doing it long enough to see if it makes a difference. I love to read about other bloggers goals and day-to-day activities! I can totally relate to the million things on the to-do list. Glad I found your blog via the BlogHer FB group! Are you in Alabama? So am I! I am in Huntsville. I came in via the BlogHer Network on FB. One of my best friends is a food blogger so I totally get what you are saying. All that work that goes into food blogging! Yikes! Good luck with everything. FYI, my friend is The Foodie Army Wife, you can Google her. Yes, I am in Birmingham! It is such a small world. 🙂 I will have to look up your friend. I love these goals! They are so well thought out. The coffee meet up was so much fun! I attended a blogging conference last year. It was a lot of fun to meet up with fellow bloggers, but I don’t feel like I got as much out of the technical side of blogging as I would have liked to. I would like to go to another one this year though.